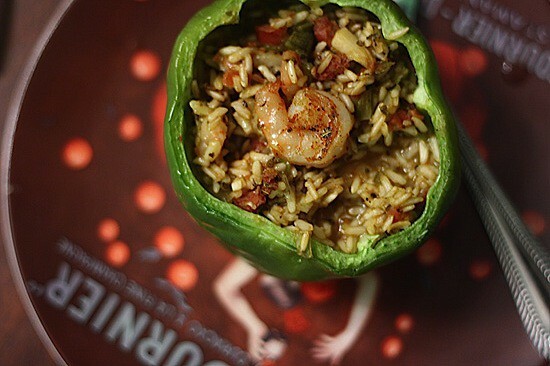 Jambalaya-Stuffed Peppers | Healthy. Delicious. Lesson learned: If you find yourself adding Tablespoons full of cayenne pepper to recipes and you still don’t think they’re spicy enough, buy some new pepper! A million apologies to the few people who recently emailed me that recipes were far too spicy – I realized that my cayenne was ancient! I bought a new jar and wow, what a difference. I’ve adjusted the amount that my recipes call for more appropriate levels. With that said, I do like things pretty hot so if you have a lower tolerance you might want to use even less. Now that that’s out of the way… I’ve been on a stuffed peppers kick lately — after not making them for over a year, we’ve had them for dinner twice in as many weeks. 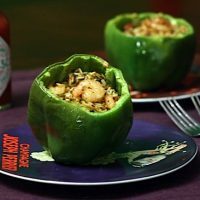 My favorite version so far has been these Jambalaya-Stuffed Peppers – instead of putting peppers in the jambalaya, I put the jambalaya in the peppers! What I loved most about these was the built-in portion control. One of these little guys left me feeling pretty full, but I know that had it not been for the pepper I could easily have polished off at least twice as much jambalaya (and gone back for more!). Of course, the fact that they tasted pretty awesome didn’t hurt either. Want a quicker version? These jambalaya-stuffed peppers take a little longer to prepare than I typically like to spend on a weeknight meal, but they’re absolutely worth it. Plus they make great leftovers! If you’re really pressed for time though, there are a few shortcuts that you can take: 1) Use instant rice, which will shave about 20 minutes off the time the jambalaya simmers; and 2) Start cooking the unstuffed peppers while you prepare the jambalaya filling (yay multitasking!). Cook the peppers for 15 minutes on their own, then 15 minutes once they’re stuffed. Just keep in mind that although these methods will dinner on the table faster, the flavors won’t have as much time to meld. I really enjoyed this recipe with the green peppers, but I like green peppers a lot. Shawn prefers red peppers, which are a little less harsh. Feel free to use whatever color you like best! Set heavy pot over high heat Add the Andouille and cook for several minutes, to allow the outside to brown. Add the onion, celery, and garlic and cook for 3-4 minutes to allow them to soften. Stir in the flour, oregano, cayenne, and thyme and cook for 1 minute. Immediately add in the tomatoes, chicken stock, Tabasco, rice, and okra. Bring to a boil, then simmer for 25 minutes or until rice is cooked through. Stir in the shrimp and cook for an additional 3 minutes. Prepare your peppers by cutting off the top and removing the seeds, creating. 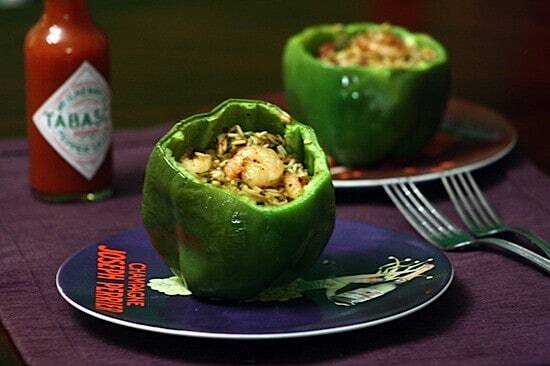 Fill each pepper with one quarter of the jambalaya, then place in a baking dish. Repeat with remaining peppers. Pout 1/2 cup of water in the bottom of the dish. Bake at 350 for 30 minutes. Serve with additional Tabasco, if desired. Odd , this page shows up with a dark hue to it, what color is the primary color on your webpage? You actually make it appear so easy along with your presentation but I find this matter to be actually one thing that I think I’d by no means understand. It seems too complex and very huge for me. I’m taking a look ahead on your next submit, I’ll attempt to get the grasp of it! cooking it now! Smells amazing.. most likely will taste awesome too. With havin so much written content do you ever run into any problems of plagorism or copyright violation? My website has a lot of unique content I’ve either created myself or outsourced but it looks like a lot of it is popping it up all over the internet without my agreement. Do you know any solutions to help reduce content from being ripped off? I’d truly appreciate it. I have had this problem. There’s really nothing you can do to eliminate it completely, but I’ve found a lot of the “content scrapers” pull from an rss feed, not the actual site. Publishing a partial feed (as opposed to having feed readers pick up the whole thing) helps a lot. Oh yum…thank you so much for this recipe. It has been added to my “must try” list. There’s nothing sadder than some cayenne that’s lost it’s zing! I probably would still love your incendiary versions–love the heat! This recipe looks like a keeper. Looks delicious! I just made stuffed peppers last week and now I’m in love. This is a wonderful twist! LOVE stuffed peppers. This is a great take on the classic recipe. 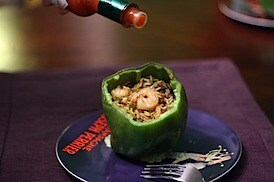 Lauren, I love jambalaya but presented in bell peppers it is taken to a different level. Isn’t cayenne pepper a spice from heaven? That is TOO funny! I’ve had my cayenne for forever but its’ definitely still got some INTENSE kick to it! When I start adding more than recipes call for, I’ll know something’s up. These peppers look delicious! Love the spicy kick. And I love that plate! This is a very creative dish. 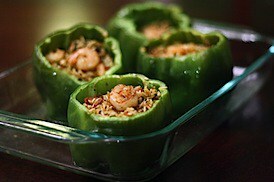 I loved stuffed peppers and always seem to go for the veggie version but these sound right up my alley. I don’t do shrimp, buy my fiance would love this dish!